:20 and :40 after, and last about 10-12 minutes each. Tune to 88.5fm to hear the lights dance! Please leave only your parking lights on while viewing - as a courtesy to our neighbors. Shows Do Not Run In The Rain - please plan your visit accordingly. We're Up and Running - Opening Night is Tonight Hilton Head! Apologies for the delay - but we're up and running on Hilton Head Island! Shows start at 6pm and run every 20 minutes (top of the hour, :20 and :40 after) thru 11pm. Tune to 88.5fm to listen to the lights dance. Working Hard to Get the Display Open! Opening Night is Here Hilton Head Island! It's been a crazy few weeks getting things set up and adjusted for the new surroundings here on Hilton Head Island - but we are ready to go and hope to see you tonight. Shows start at 6pm and run every 20 minutes (top of the hour, :20 and :40 after) thru 11pm. Tune to 88.5fm to listen to the lights dance. Testing is currently underway and we are looking to spin up shows this weekend - December 1 or 2 if at all possible. Things are progressing every day and if we are ready for previews, we'll post here and on our facebook page. It's with great sadness that we let you know our run in Urbana has come to an end. We've sold our house and are moving to Hilton Head Island, South Carolina. We'll always remember the joy, laughter and smiles you gave us over the years. It made putting the show on both worthwhile and rewarding. Thanks sincerely for helping us spread the spirit of Christmas. We loved every minute of it and meeting many of you over the years. We'll let you know where the show will go on hopefully beginning around this time in 2017! On New Years Eve, you'll have your last chance to see the show this Holiday Season. We'll be running shows from 5pm thru midnight and capping the evening with a special once a year show at midnight. Following that show - the display will go into storage until December 1, 2016. If you don't have plans, bring some noisemakers and party hats and join our family as we ring in the new year - bright light style. We hope to see you here. The rain is back and that's not good for the lights. If showers continue thru 9pm or later tonite, shows will have to be cancelled. We'll update in a few hours. As of 11am - shows are able to run and most all the lights are on. Given the weather, be sure to check back later today before heading out - but it appears a Christmas Miracle has happened and we may be able to have a bright Christmas Eve here in Urbana! 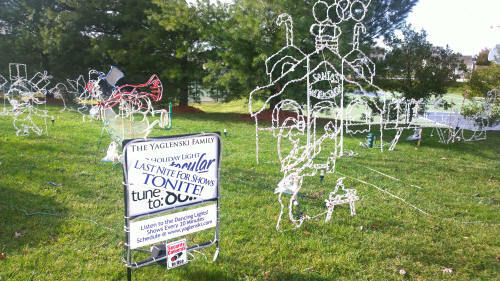 Thanks to the Villages of Urbana Community Association, Inc. for recognizing us in their Holiday Light Contest. Years ago we stopped entering, but apparently you don't enter anymore, they just pick you. Honored to see they created a whole new category that didn't exist before in bestowing us with the best "Semi-Pro" house. Thanks to the Wall Street Journal for the Great Coverage! A big thank you to the Wall Street Journal and reporter Dan Goldstein and videographer Sloan Dickey for the coverage and nice video piece on our Christmas light display. It's the Weekend - Come Visit & Help Fight Thyroid Cancer! The countdown to Christmas is on and it's a great time for you to come visit and soak up the Christmas magic! We hope to see you here! If you do drop by, consider donating to support Thyroid Cancer Awareness. All funds left in Santa's mailbox will be contributed directly to ThyCa: Thyroid Cancer Survivors Association, Inc.
We're still out in the yard working on the finishing touches - but we'll be ready for opening night this evening at 6pm! Hope to see you here! After a number of really wet days, we've finally made good progress and can announced that Wednesday, December 9 will be our opening night. See you here then! 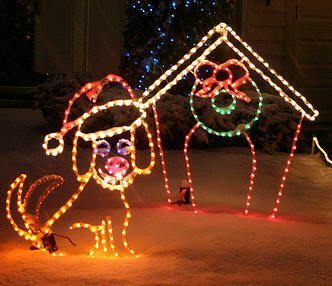 Since may of you have been emailing and asking - yes, we are planning on doing this lights this year. That being said, we're off to a late start and hope to have things up and running by the first weekend in December. We'll keep you posted here! Merry Christmas - Extended Hours! In honor of Christmas and because of the lousy weather over the last few days, we're extending operation till midnight tonight. Lights go on at 6pm! Shows Officially Begin This Friday! Opening night of the 2014 Yaglenski Family Dancing Holiday Light Spectacular will be this Friday, December 6th. First show is 6pm. Update - When Will The Shows Start? Still behind the eight ball a bit. The biggest challenge right now is getting the lights, wreath, sled and Santa's ladder on the front of the house. This requires the lower roof to be free of snow/ice. Need warmer temps which Sunday/Monday should bring. If we were to guess, we're looking at Wednesday for an official opening. Testing as early as Sunday with show elements missing. Will keep you posted here and on our Facebook Page. To Everyone who has asked - yes, the show will go on this year! The lights will be coming down from the attic soon. We look forward to seeing you for a FULL SEASON beginning on or around Thanksgiving. Exact date coming soon! On New Years Eve, you'll have your last chance to see the show this Holiday Season. We'll be running shows from 6pm thru midnight and capping the evening with a special once a year show at midnight. Following that show - the display will go into storage until December 1, 2014. Thanks to everyone for a great first day. We've decided to extend shows till Midnight Christmas Eve and Christmas Day - so make a pajama run and drive out to see us before Santa arrives! We want to thank everyone who has written, commented or otherwise offered words of encouragement as we worked over the last few days to get things set up and ready to go. We tested the shows last night and everything is ready to go for tonight, weather permitting. We hope to see you here! It's been a crazy month and a half - but following surgery, I've felt well enough and missed the Christmas spirit - so along with my family and a number of neighbors, we managed to get most of the pieces assembled over the last few days to put together a show that we can still be proud of. It won't quite have everything, but 95% of all the items will be out on the lawn and on! We'll start officially running this Monday and will be testing all this weekend. That means, if you drive by Saturday or Sunday, things might or might not be on and things may or may not be functioning. Plans are now to run at least thru January 1 - but we'll keep you updated if we extend things a bit further. Thanks to everyone for your kind words of encouragement! Hey Everyone - I have some bad news. Unfortunately less than a month back I was diagnosed with Thyroid Cancer. It's been a trying few weeks since then leading up to surgery tomorrow. Because of that, and not knowing the road ahead beyond the surgery, we have to cancel the light show this holiday season. It's a shame because we were really looking forward to putting it on and never intended to go two years without the lights being on. If things change and we somehow can get things together in Mid December, I'll be sure to post to let everyone know. Thanks for your support over the years. It means a lot to us. Sad as it is to say - the Yaglenski Family Dancing Holiday Light Spectacular is taking this year off. However, we do plan to return again in 2013. With the lousy economy, vandalism that struck late last year and a few health issues, my wife and I decided we would instead get back to basics and focus on our family. The house won't be dark but decorations will be similar to those we did when we moved in back in 1999. We sincerely hope you understand - but we honestly needed a break. The amount of work and money that goes into putting on a show this size every year is huge and after last year, we were feeling completely worn out. On New Years Eve, you'll have your last chance to see the show this Holiday Season. We'll be running shows from 6pm thru midnight and capping the evening with a special once a year show at midnight. Following that show - the display will go into storage until next December 1. If you don't have plans, bring some noisemakers and party hats and join us as we ring in the new year - bright light style. We hope to see you here. As a special note - we'll be running the display tonight (Friday) and on Christmas Eve and Christmas Day thru midnight. We'll also be leaving the lights on all night on Christmas Eve after the shows end. Finally, on New Years Eve, we'll be doing shows thru midnight with a special once a year show at midnight. Following that show - the display will go into storage until next December 1. Just a heads up if you are thinking of stopping by the display this evening - heavy rains thru the late afternoon will likely cause the shows to be cancelled tonite. Skies appear to be clear tomorrow thru the weekend with moderate temperatures - so we look forward to seeing you then. As a special note - we'll be running the display on Christmas Eve and Christmas Day thru midnight - and leaving the lights on all night on Christmas Eve after the shows end. Also, on new years, we'll be doing shows thru midnight with a special New Years Eve show at midnight. Following that show - the display will go into storage until next December 1. Thanks to the keen eyes of a nearby neighbor, the missing dog wireframe was spotted a few blocks from our house where the criminals must have dumped the evidence. Not only was our piece found but another snowman figurine was located in the same spot. We haven't given up looking for who vandalized the display and are circulating the videos and pictures we have to the community and local media as well. In the meantime, we have also upgraded our security system so it covers every part of the yard in higher definition - along with routes in and out of the development visible from our house. Along with the disappointment of having something like this happen, there have been positives to take away. Community support has been stellar and folks have been writing and emailing letting us know how sorry they are that vandalism happened and offering assistance. This also includes the Frederick News Post & The Gazette. From our family to yours - a heartfelt THANK YOU! Update: We've posted one of the many videos we've tuned over to the police online here: http://youtu.be/a3w_FYYkoAs. If you know the individuals in the video, please contact us. Well, I suppose it had to happen again at some point... as I've been decorating for 10 years and this is only the second time I've had any issues. Tonight at 1:11am, a late model Honda Civic (we've turned info and video over to the police) drove by and stole our dog wagging tail wireframe. Then at 2:12am - the same car pulled thru the community center, took a right on Clendenin and drove slightly past my house to park across the street from 9054 Clendenin. Two youths, one wearing a grey sweatshirt and another wearing a darker sweatshirt and light colored cap proceeded to enter my yard, pull wireframes (lighted Christmas displays), uproot some of the candy canes and peppermints in the front of the display and physically REMOVED/STOLE 2 items - A doghouse and a dog with wagging tail and 2 way controller. They were on the yard all of about 2 minutes before I heard them and scared them off. I have recovered the dog house itself but am still missing the dog. I have security footage of both youths and I have turned it over to the Frederick County Sheriffs department. The Dog wireframe is missing. If you see a Christmas display about 4 feet tall in the shape of a dog that has a wagging tail (picture above) - please contact me via the form on the site and let me know. We have the doghouse - just the dog is missing. I have to be honest... this kind of thing happening really makes you not want to do this anymore. From December 1 - December 31 - I sleep with one eye open practically. It's not very restful and I worry greatly about all the stuff I have out on the yard. The pieces are hard to come by and they have sentimental value as well. If you have any information on anything that would lead to these folks being caught and brought to justice, call me or the Frederick County Sheriffs office. I greatly appreciate your help. For now, I'm angry and out the money it costs to replace the piece unless it shows up. Great Weekend To See The Lights! Weather has been great and everything is in good working order in the display. It's a great time to park your car in the community center parking lot and walk up to see the display outdoors. There's music on in the yard and it's much better up close! Please do remember not to enter the yard. If you decide to watch from your car, please DIM YOUR HEADLIGHTS as a courtesy to our neighbors and others viewing the show. It's been pretty crowded with the coverage on Fox News - so arrive for the early shows or come to late shows for best parking spots. Unfortunately rain is forecast - which means the light show for tonight may be cancelled. Due to safety concerns and ground fault issues, the display doesn't operate well when everything is soaked. We suggest if you want to see the Holiday Light Spectacular, you plan on visiting Thursday instead. Shows Start Tonite & Run Every 20 Minutes! The time has come, the yard is set up and the shows are ready to roll! Opening nite is tonite and we look forward to seeing you here in Urbana! We know some of you like to play the game - what's new - trying to figure out what's been added to the display since last year. So, below we'll list it - just highlight between the brackets with your mouse to see the answer. Leave a Letter For Santa - Get a Letter Back From Santa! Again this year, we at the Yaglenski Dancing Holiday Light Spectacular have a direct line to the Jolly Old Elf Himself via our Santa's Mailbox. If you leave a letter to Santa with your return address on it, Santa will send you a personal response. Every year, we get a lot of letters, but only a handful have a return address. Thank You To Fox 5 News DC! Time to Get Down The Boxes! Tonite was the final night for the season, and we want to sincerely thank everyone who came out to visit. It was beyond a doubt, our biggest and most successful year ever (we didn't even have to cancel a single show due to rain) and we owe it all to you for spreading the word. Next year, we hope to extend the season beginning shows Thanksgiving night and running them thru New Years. TONITE - Christmas Eve - Extended Hours! We'll be extending the hours of the display thru midnight tonite. So, if you are looking for something to do with the family - head on out to see the display as you celebrate Christmas! A friendly reminder - this year the light show ends on Christmas Night - December 25th. Please head on out before then to see the spectacle and celebration that is our display - and bring a friend or two with you. With rain in the forecast for tonite and most of the day tomorrow, please check the website before driving a long distance to see the display in the rain. Because of the complexity of the show and the electrical system, we do not run the show in heavy rain. In light rain, we may need to disconnect or unplug certain items to keey things running. We'll post to the site with notice as soon as we modify the schedule or decide to shut the display off for the night. Wondering what you'll see if you come out to the display? Look no further, as we've captured a glimpse of one of our newest songs - Spiraling's Do You Hear What I Hear. It's a great tune of a classic Christmas song set to the tune of the Who's Baba O'Reily. You can't quite get the feeling of being here without a multiple camera shoot (you can't see a bunch of the display in the video) but you'll get the idea! ENJOY! No, we swear it wasn't us... apologies to those who headed out to Urbana last night only to see the whole town was powered down! Around 8:45-ish, power went out and wasn't restored until nearly 10:30pm. We expect things to be shining bright tonite again! 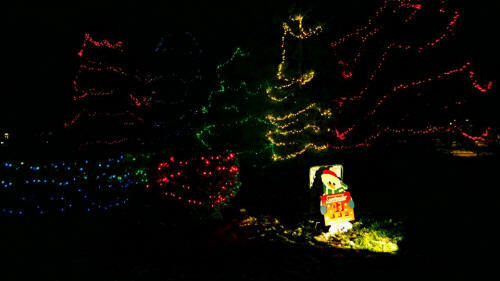 Social networkers, the Yaglenski Family Holiday Light Spectacular is now on Gowalla. Be sure to check in and let the world know you came to visit! Don't know what Gowalla is? Find out here. Wondering What's New This Year? Lights Debut Tonite at 6pm - Shows Every 20 Minutes! The debut of the Yaglenski Family Dancing Holiday Light Spectacular is tonite, December 1. We had hoped to have run a preview night yesterday but the weather really didn't cooperate - however it looks like things should dry out in time for the shows to start on time. We look forward to seeing you here! A nice day of weather allowed a lot of work to get done yesterday. All the wireframes are out and the lights are up - which means the big chore of lighting the trees and wiring the yard is ahead. We've also sequenced two new songs for this year which we're very excited about - Spiraling's Do You Hear What I Hear and Michael W. Smith's Gloria. Actually, things have been underway for weeks now but the heavy lifting starts this weekend as we pull the supplies, displays and lights down from the attic and begin the testing process for the 2010 Show. Please note this year - we will only be running the show until Christmas. After the 25th, the show will go dark until the 2011 Season. Arrive early and often! Due to the weather conditions this year, we've decided to run the display a couple of extra nights to give everyone a final chance to come out and see the Light Spectacular. Shows will run from 6pm till 11pm Friday and Saturday with the final show of the season at 10:40pm on Saturday night. We hope to see you here for one last blast of Christmas Magic! Shows On - Lights Are Operating 6pm to 10pm! Things should be back in good working order tonight as the warmer temperatures and now SUNSHINE today are allowing the display to dry out. Last night we were able to operate with all but three items (a penguin, the ice pond and workshop walkway). Our guess is that everything will be on tonight and shows will run as normal from 6pm till 10pm. We look forward to seeing you! Unfortunately, heavy rain is forecast which means in all likelihood, the light show for tonight will be cancelled - which is unfortunate since today is Christmas. Due to ground fault issues, the display doesn't operate well when everything is soaked and as you may have seen, a flood watch is in effect. We suggest if you want to see the Holiday Light Spectacular, you plan on visiting Saturday or Sunday instead. Shows Are Christmas Eve - Extended Hours! We'll be extending the hours of the display thru midnight tonite - and we'll be premiering a few new songs from Denver and the Mile High Orchestra as well. So, if you are looking for something to do with the family - head on out to see the display! The Blizzard of 2009 is upon us and the snow is still coming down heavy at 4:30pm Saturday - which makes for an interesting time show wise. All the lights are still working and they have been on since 11pm last nite. We're going to attempt running shows even though we don't expect ANYONE to come and visit other than sledding neighbors. Because of the amount of snow, this certainly puts a crimp in things. It's going to make viewing difficult from cars in the week ahead. Forecast is for things to stay cold, so the snow could be with us on the yard for a while. Depending on how things shake out, we may extend the Display thru the first week of January to give folks extra time to see it as it should be seen. Why Are The Lights On During The Day?? With a wintery weekend forecast ahead for Saturday and Sunday - you might notice during the storm the lights are on both day and night. The reason? To keep the snow from building up and things as water free as possible. The mini's generate enough heat to melt flakes as they hit, which helps everything stay visible for the shows at night. Now, that being said, you never know how 5+ inches might effect things - so before heading out to see the lights, check the website. We'll update if the show is not operating. On a side note, Toasty the Snowman along with his Elf friend arrived today and are out on the yard as we type - looking great! This year has been a bit of a challenge. We typically add one or two new things each year to the display and this year, when we went to buy the piece we wanted, it was sold out till 2010. So, after a few phone calls and emails, we were able to get hold of Lori and Lori's Lighted D'lites and they agreed to make what we wanted from scratch. It shipped yesterday and should be here late this week in time for the final weekend before Christmas. Also arriving is a hammering elf to add to our Santa's workshop scene. Thanks go out to John Patti from WBAL / Christmas in Maryland for stopping by tonight and interviewing us. We're looking forward to hearing the show on stations all across Maryland Christmas Eve. Also, Frederick Magazine's December edition has a nice little feature on our display and picture of our family as does Montgomery Go Life magazine. 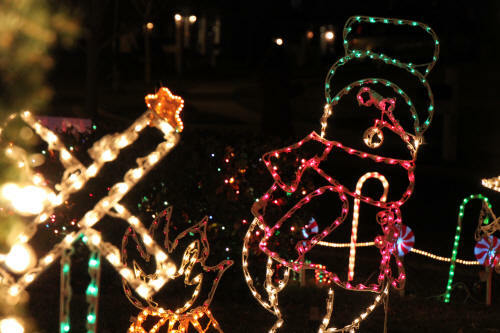 The debut of the Yaglenski Family Dancing Holiday Light Spectacular is tonite, December 1. We've tested things and everything looks and runs great. The show will be updated in the coming weeks with a few new numbers that are sure to delight your eyes as well! We're still testing things but anticipate on running shows beginning at 6pm Sunday nite in preparation for our official opening nite - Tuesday December 1. If you are in the neighborhood, feel free to stop by and say hi. Keep in mind - shows can stop or start at any time so we can adjust, tweak and improve things. Update - Tests were successful & the debut Tuesday is a GO! We've begun our search for additions to the 2009 Display. We've got a few ideas but nothing is finalized. If you have thoughts or know of something cool, drop us a line via the contact link! Special Show At Midnight Tonight - New Years Celebration! As tonight is the final night for the Yaglenski Family Dancing Holiday Light Spectacular, we've decided to throw in some special additions! At midnight, we'll ring in the New Year with "Auld Lang Syne" followed by "Reflections of Earth" - sequences produced especially for our final night. The display will run till 1am as part of the celebration and will remain lit after that all night long. We hope to see you for this special occasion! Just a reminder - we're getting close to the end of another season for the Yaglenski Family Holiday Light Spectacular. The final shows run New Years Eve all night long leading up to the final show of the year at midnight. Make your plans to come out now. Due to the popularity of the shows this year thanks to the media coverage, we'll be running the Yaglenski Family Holiday Light Spectacular extra hours this evening and tomorrow. We'll start the shows early at 5pm and run until 11pm so that more folks can enjoy the sights and sounds of the season! Hope to see you here as you make us part of your Christmas tradition! Two New Sequences Debut Tomorrow at 7pm! Finally had a few moments of free time this evening and we added 2 new songs into the 7pm show - pulling repeats of earlier songs. The Brian Setzer Orchestra's Boogie Woogie Santa Claus and the classic - Snow Mizer & Heat Mizer from the animated favorite "The Year Without A Santa Claus" are sure to spice things up. If you miss the 7pm show to see the debut - you can stop by for repeat performances at 8:20 & 9:40pm. Also, don't forget we also run all NEW YEARS EVE long and culminate with a special one run a year show that features Reflections of Earth and Auld Lang Sine at midnight. Seems mother nature just isn't cooperating this year. In addition to the weather being cold and bitter when the lights were going up in November (usually we get days in the high 50's to low 60's - some years we've hit near 70), this December has been filled with rain and damp conditions which plays havoc with the display. Rain - especially heavy soaking rain causes Ground Fault Interrupts to trip in certain items in the show - and that in turn causes us to have to unplug items. For example, tonite the Frosty Train, Seals and Pond all had to be turned off in order to get things to run. And it's not always the same item - which makes it trickier still. We've been able to run all but one night this year but it's been far from perfect. The next few days look a little shaky too. Here's hoping we get some nice weather in time for the weekend so you can enjoy the show! After a day long rain - we had too many GFCI problems to run the show tonite. Add to the fact that I wasn't at home this evening to fix things and was trying to relay via phone instructions..."unplug this, try this, no - try this instead". It just didn't work out so we turned everything off. My sincere apologies to anyone who traveled here to try to see the lights this evening. We try to post on the site when we're having problems ahead of time. The good news is, after getting home around 11pm tonite, I believe I have narrowed down the items causing the problem and can run in a "Reduced Show or B Mode" where a couple things are off, but otherwise the show runs. This will be handy with the weather looking to swing back and forth over the next few days. We can usually operate in SNOW with no issue, but RAIN causes all sorts of problems with a display this complex. Again - I'm sorry the show's didn't run tonite. This afternoon brought a reporter from NBC 25 to our doorsteps to find out more about the display in prep for a piece to air at 6pm. Jackie Waite was great to talk to but unfortunately got the name of the town wrong... she said it was Thurmont, not Urbana. So, I can just picture people driving around Thurmont wondering - where the heck is the display. Also, the video was taken in the day so it really didn't convey the display very well - but a welcome addition to the press none the less! Thanks Jackie! Lights are Up and Running - Shows Every 20 Minutes! Thanks to the folks who came out tonight to see the lights on their debut night. Things are up and operating great despite the damp weather. The show schedule is on the site and will be updated in the coming weeks with a few new numbers that are sure to delight your eyes! Trying to Use The Contact From? Mail Now Fixed! We moved servers over the summer and didn't notice till now that our contact form was broken. It's now fixed just in time for the Christmas Season - so if you need to get in touch with us, it should be functioning now! Looking at the forecast, things are supposed to clear up around 5pm tomorrow, which should clear the way for the shows to be running at 6pm. Due to all the dampness from the rain over the past 24 hours, we may be running in B SHOW mode - which means some elements may not be lit (such as the pond of lights) due to them needing to dry out and avoid tripping circuits. We're about 95% sure things should be a go and will post here tomorrow around 5:30 if things are up and operating at 100% or if we are in reduced show mode. In order to facilitate participation in the Villages of Urbana Holiday Light Contest, we decided not to enter this year and instead, we'll be judging the Townhome category. After winning the Single Family Category 5 times, a year off seemed appropriate to allow everyone else get into the Christmas Season! We're still testing things but anticipate on running shows beginning at 6pm Saturday nite in preparation for our official opening nite - Monday December 1. If you are in the neighborhood, feel free to stop by and say hi. What's new for 2008 you ask? Frosty is coming to town and he's arriving on a train that's 6 feet tall and 20 feet wide from the Holiday Light Store. This showcase piece is sure to delight all with puffs of smoke, waving frosty and animated wheels. We'll also be adding a Fishing Penguin from our favorite - Holidays With Lights to our Ice Pond and a animated Carousel from Linda's Yard Art. Pictures below! In addition, John has been working on a replica of a Tin Star that adorned his parents house growing up. It's nearly complete and will be posted to the site soon. 15 days till light up! Well, in reality, it began over the summer when we ordered our third 16 channel light-o-rama controller but we continued our planning and preparation over the weekend as we selected from hundreds of new designs in an effort to determine what we'll add to the display for 2008. The final decision should be made soon - and we'll post the information here! 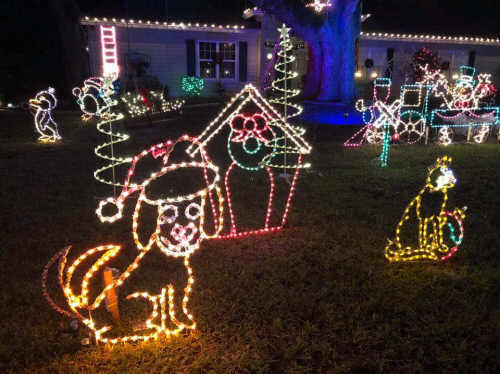 most unique residential Christmas and Holiday Light Displays. 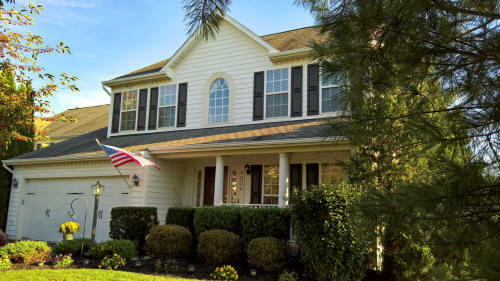 Located in Urbana, Maryland - Just 10 minutes from Downtown Frederick.